Biography of French Naturalist Painter. Minneapolis Institute of Arts, USA. 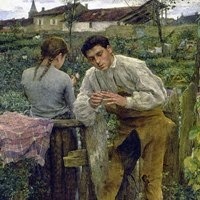 Jules Bastien-Lepage was a French painter noted for his sentimental genre painting of rural life. Despite growing up during the era of Impressionism, his style of plein air painting was closer to the naturalism of the Realism art movement than the light-oriented art of Claude Monet (1840-1926). Ironically, a number of Impressionist painters - in Scotland, Holland, America and Australia - preferred to adopt his style of naturalist realist painting rather than Impressionism proper. The French realist writer Emile Zola, who described Bastien-Lepage as "the grandson of Courbet and of Millet", later charactized his painting as: "Impressionism corrected, sweetened and adapted to suit the taste of the masses." As well as genre pictures he excelled at portrait art, for which he had a loyal clientele within the theatre. His finest works include: Haymaking (1877, Musee d'Orsay); Season of October (1878, National Gallery of Victoria, Melbourne); Joan of Arc (1879, Metropolitan Museum of Art, New York); Portrait of Marie Samary of the Odeon Theatre (1881, Cleveland Museum of Art); and L'Amour au Village (Rural Love) (1882, Pushkin Museum of Fine Arts, Moscow). NOTE: For more about the Realist-Impressionist connection, see: Realism to Impressionism (1830-1900). Bastien-Lepage grew up on a farm in the village of Damvillers, in the Meuse region of France. Bastien had a natural talent for sketching, and his parents cultivated this by providing him with prints of paintings for him to copy. Although he was taught the rudiments of drawing by his father, his formal training began at Verdun, and afterwards in Paris, where in 1867 he gained entry to the prestigious Ecole des Beaux-arts, working under Alexander Cabanel. During his three year course he won first prize for drawing, but the paintings he exhibited in the Salons of 1870 and 1872 attracted little or no attention. Then, in 1874, following his recovery from wounds suffered in the Franco-Prussian War, he achieved critical acclaim for both his study of rural life entitled Song of Spring, and his Portrait of my Grandfather, noted for its true-to-life qualities. Although he failed on two occasions (in 1875 and 1876) to win the Prix de Rome, his painting continued to impress the critics. His successes included First Communion (1875), Portrait of M. Hayern (1875), Angels appearing to the Shepherds (1875), Priam at the Feet of Achilles (1876, Lille Gallery), and Haymaking (Les Foins) (1877). During his tragically short career (c.1874-84) Bastien-Lepage focused his attention on two types of subject: portraiture - notably of theatrical performers, from Sarah Bernhardt downwards  and rural subjects, mostly of everyday scenes, typically painted in the district of his childhood. His style of painting absorbed important elements from both his predecessors as well as his contemporaries. Thus he borrowed techniques (mostly compositional elements) from realist artists like Gustave Corbet and Jean-Francois Millet, as well as the light tones and vibrant touch of the Impressionists. His portraiture continued to attract acclaim. 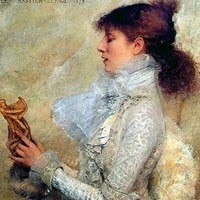 His Portrait of Madamoiselle Sarah Bernhardt (1879), for instance, won him the Legion of Honour. Other outstanding portraits included those of Joan of Arc listening to the Voices, Albert Wolf, the Prince of Wales, and Le Pere Jacques. In his 1920 Essay in Aesthetics, the influential English art critic Roger Fry acknowledged the important role played by Jules Bastien-Lepage in winning over the public to Impressionism. This, despite the fact that he differed from the Impressionists in two important ways. First, his painting was far more sentimental. It is inconceivable that Monet or even Degas would inject their landscapes or genre works with such narrative. Second, unlike French Impressionists for whom the representation of light was all-important, he remained relatively uninterested in this transitory feature. Once he began to achieve fame, Bastien-Lepage travelled - to England, Switzerland and Italy - returning with landscapes, portraits and genre paintings, as well as hybrid pictures of children and adolescents, such as The London Bootblack (1882, Musee des Arts Decoratifs). After attempting in vain to recover his health in the sunshine of Algiers, he returned to Paris where he died of cancer in 1884. In the Spring of 1885, not long after his death, a special commemorative exhibition featuring more than 200 of his paintings and drawings, was staged at the Ecole des Beaux-Arts in Paris. In 1889 a selection of his finest work was put on show at the Paris Exposition. A museum dedicated to his art was later opened at Montmedy, a commune in the Meuse department in Lorraine, north-eastern France. 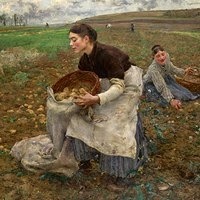 Paintings by Jules Bastien-Lepage can be viewed in several of the best art museums around the world.  For biographies of other Realist artists, see: Famous Painters.